What was the “Spanish” Flu? How did Influenza reach Nova Scotia and spread? 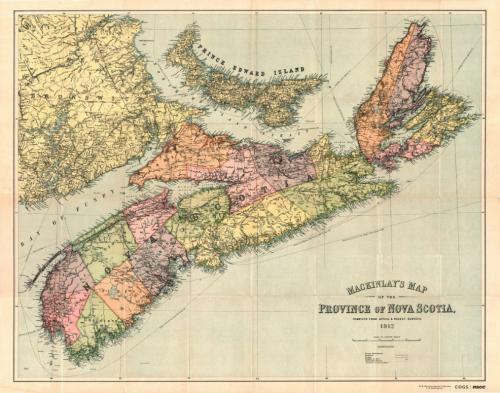 MacKinlay’s Map of the Province of Nova Scotia, Compiled from Actual & Recent Surveys, A.W. MacKinlay, [Halifax], 1912. Digital reproduction from the W. K. Morrison Special Collection of the J. B. Hall Library at the NSCC Centre of Geographic Sciences. The years 2018 to 2020 mark the 100th anniversary of the largest disease pandemic ever to occur globally, that of the outbreak of influenza which occurred beginning in 1918. It appeared in three “waves”. The first began in the Spring of 1918, with minimal effect on Nova Scotia. The second, devastating, outbreak occurred in the Fall and Winter of 1918-19, and the last in the first four months of 1920. The so-called “Spanish” Flu killed over 2,000 Nova Scotians, more than in the 1917 Halifax Explosion, and dramatically changed the lives of many others, but has been largely forgotten by most. The Nova Scotia Museum and the Nova Scotia Archives have been working with medical historian Dr. Allan Marble, Curator Emeritus Ruth Whitehead, and many others to bring the little-known stories of how the flu pandemic affected Nova Scotian communities and families to light. Those profiled here will highlight how the pandemic was dealt with in Nova Scotia by the medical authorities, and why the experience of the 1918 pandemic is still very relevant to contemporary public health discussions, particularly around the need for vaccinations, in the province today. In addition to profiling stories of the courage of everyday Nova Scotian families and communities who suffered through the pandemic, we hope this site will prove to be a useful resource for anyone researching this topic, including students and teachers, members of the general public and scholars. Researchers have compiled working lists of those who died from the flu pandemic by county. These are accessible on request at the Nova Scotia Museum, and we hope to eventually host them on this site. Beyond the initial stories profiled at the launch of this project, we hope to add additional community and individual narratives of flu pandemic experiences from across Nova Scotia over the coming year, reflecting the period the illness was present in the province. Finally, the original, more detailed, county research files used as the basis of the stories presented here are held at the Nova Scotia Museum, and available to researchers who wish to access and review them. Much of this material consists of copies of, and notes/summaries made from, various newspaper obituaries and articles, vital statistics records, and other original sources available at the Nova Scotia Archives. These include Dr. Allan Marble’s original research notes of Spanish flu deaths by county (derived from official vital statistic records and Nova Scotian newspaper obituaries between 1918 and 1920), and Ruth Whitehead’s extensive county research files. 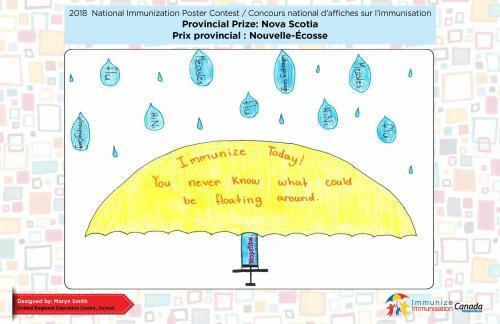 2018 National Immunization Poster Contest, Provincial Prize for Nova Scotia. Designed by Maryn Smith, Oxford Regional Education Centre, Oxford, for Immunize Canada.